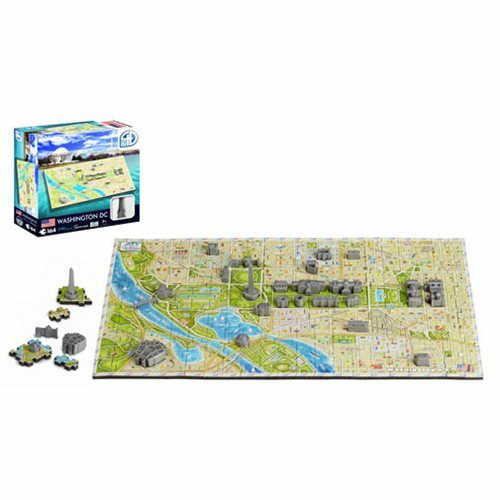 Washington DC USA Mini 4D Puzzle is a smaller size version of the famous 4D Cityscape Washington DC Time Puzzle. You first assemble the mini map puzzle of Washington DC which is made out of unique dense foam material. You then hop on a bus tour of the city as you insert 24 plastic building replicas into the map! This tour includes iconic structures as the Washington Monument, The Pentagon, Jefferson Memorial, Lincoln Memorial, The White House, and US Capitol. The buildings fit into pre-cut holes in a traditional 2D jigsaw puzzle that form the city's street layout. The product includes a bus tour poster that directs you around the city as you rebuild the famous Washington DC skyline. When assembled measures about 14-inches wide x 8-inches long x 2-inches tall. 164 pieces. Ages 7 and up.